With Halloween now dwindling one week away, I took some time to let my inner makeup artist shine and try on new looks inspired by those seen on one of my favorite Pinterest boards. I also gathered inspiration from Youtube’s gurus for some very creative costume hacks, a few of which I can’t wait to show off at LCCC’s HalloQueen Costume Contest next week. Don’t go batty this year worrying about a last-minute costume—this post has you covered! 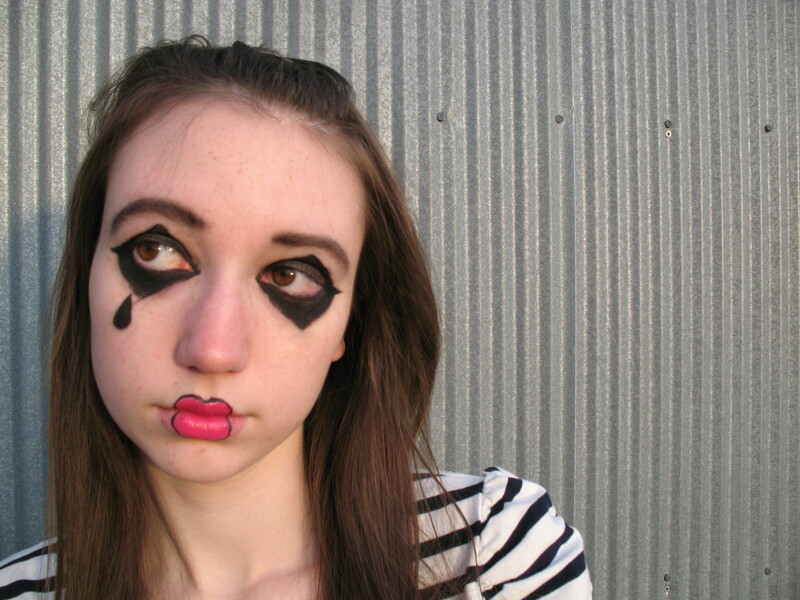 With my dark hair and eyes, this mime look was a bit more difficult to pull of. Cheaper than store-bought, duplicated outfits at the store, homemade costumes give off the best vibes of individuality and creativity. There are so many ways to make your own costume, from makeup to clothes to pure attitude. This Halloween my favorite homemade option is the cosmetics route, because it’s for any range of talent, it’s inexpensive (if you have what you need or know where to get it), and I can transform in ways I haven’t been able to with clothes alone—a fairy, mermaid, mime, superhero, or even a fairy-mermaid-superhero-mime (it could happen). 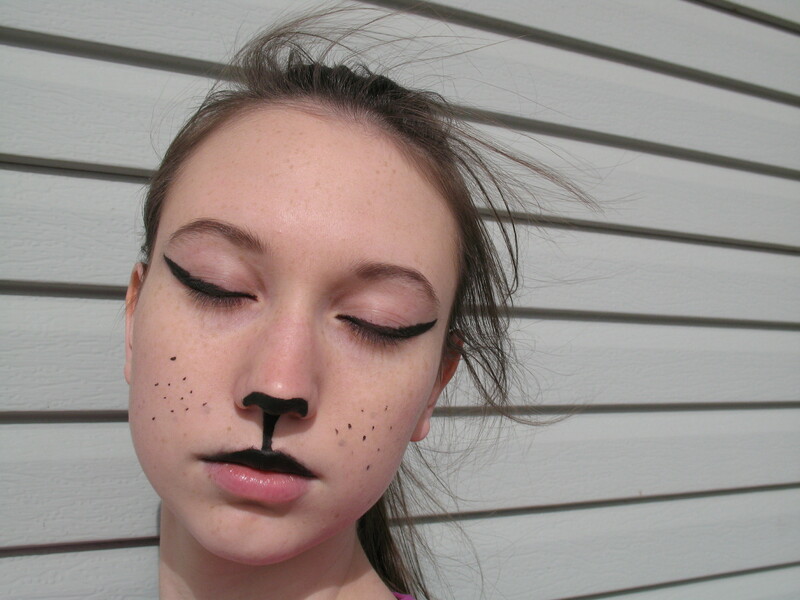 Of the many Halloween makeup looks I tried on, Femme Feline was my favorite. As with school spirit and the ZombieFest, your costume can be as drastic or demure as you like. I personally discovered that even though I’m comfortable wearing a lot of makeup, the looks that require more facial coverage are more difficult for me to pull off, so I cut back to somewhere in the middle. 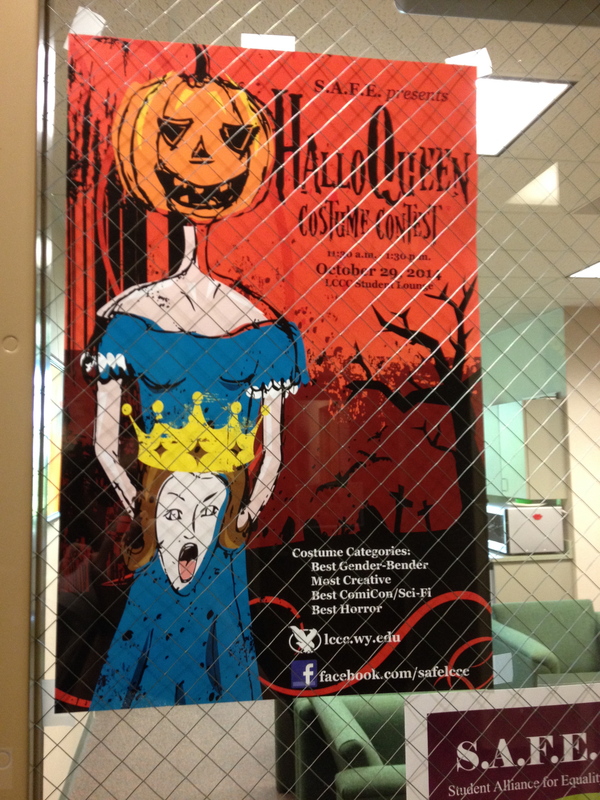 A well designed poster for the HalloQueen costume contest. LCCC’s Student Alliance for Equality (S.A.F.E.) is sponsoring their Second Annual HalloQueen Costume Contest. The contest consists of four categories: Best Gender-Bender Costume, Most Creative Costume, Best ComiCon/Sci-Fi Costume, and Best Horror Costume. HalloQueen will be held in the Student Lounge this Wednesday, Oct. 29 from 11:30 a.m. to 1:30 p.m. Hopefully this post gave you plenty of ideas to use and put together something unique—and have fun doing it! Know of any other costume or Halloween events taking place in Cheyenne? Got a favorite haunted house? Share it in the comments below! Looking for some amusement this weekend? Saturday, September 20, is the return of the Cheyenne Zombie Fest for year 4. According to the official Cheyenne, Wyoming website, the event lasts from 9 a.m. to midnight in all parts of downtown. While being mostly free or reliant on donations, Zombie Fest is hosted by the Cheyenne Little Theater to raise money for their yearly plays and various events. That means some activities do cost to enjoy. This year’s special guest is Matt Mogk from AMC’s Talking Dead and head of the Zombie Research Society. (I guess you could say he’s the brains of the operation…) Go show him your undying fan affection at the Atlas Theater. But the fun doesn’t stop there! Before and after his presentations, crawl on over to the Zombie Fashion Show, Brain Eating Contest, and professional Gore Makeup as well as Zombie Olympics and Zombieland for the demon kiddos. So bring your mummy, this festival is for all ages, boys and ghouls! For all the gory details check out the official PDF with times, locations, and pricing. Not an actual walking corpse? YouTube is your best friend for Halloween inspired makeup tutorials. Most of the supplies you need are found around the house or stuffed inside your girlfriend’s cosmetics drawer. Here’s a link to one of my favorite freaky tutorials, with both a normal makeup option and a special effects option. If you don’t feel comfortable doing your own costume, there will be a gore makeup station at the festival to help you get horrific. Now all you really need is a little imagination and the courage to flaunt your rotting flesh. And if you do get zombie-fied, comment below with a pic, we’d love to see the scary! If you’re still not convinced, check out some of our posts about previous Zombie Fest riot in the Cowboy State. Have fun, zombies, and remember: No guts, no glory! Holidays are approaching fast! With that in mind, finding fun scary events to celebrate Halloween are a great way to spend time with family or friends. They also get your heart racing! There are many ideas such as a party, going to a corn maze, haunted tours, or even going with friends to get spooked in a cemetery. There are many options that are affordable for any one, including broke college students! While sports can make your heart race, so can the thrills of being scared. There is nothing more exhilarating than that rush that overcomes your body when you are scared. Even though its not the same heart racing effect after a long exercise, it may feel that way. Plus, with all the holiday fun, who really wants to spend time running on a treadmill to begin with. There are many fun thrills around the Halloween season that can get a heart to pump. Not only are corn mazes fun, they can be a scare also. Spending time outside at night has never been so much fun. Just outside of Ft. Collins on the Cheyenne side there is a place for Halloween activities for the whole family. Not only is there a haunted corn maze, but there is a pumpkin patch, jumping castles for the little ones, a petting zoo, and much more. This 15 acre corn maze is the main attraction. It will keep everyone no matter what age guessing at every turn. It may not be an ‘outdoor’ thrill but haunted houses do get your heart racing and out of the house. Well you’re own house that is. Here in Cheyenne, The Nightmare on 17th st. seems to be a popular choice for haunted house tours. It cost 10$ per person, and no one under the age of 6 is aloud. The Atlas Theatre is known to be one of the most haunted buildings in the Cheyenne area. From October 14-31 the theatre is turned into a haunted house. I cost 10$ per person and is open from 7:00pm-12:00am. The Atlas Theatre was built in 1887. The story behind the haunting was about a preacher who killed his wife and hung himself in the theatre. If you are looking to get out of town for a weekend and spend time outside, Estes Park is a great choice. Estes Park Colorado has the Stanley Hotel which has many haunted tours and events going on around Halloween. When not getting scared, there are many outdoor activities for the whole family.